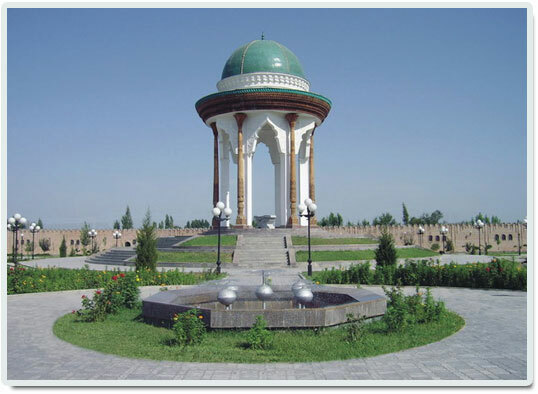 The city is located 12 kilometers from the regional center and is one of the oldest cities in the Fergana Valley. City area - 50 sq.m and a population of over 165,000 people. Margilan located at an altitude of 475 meters above sea level. 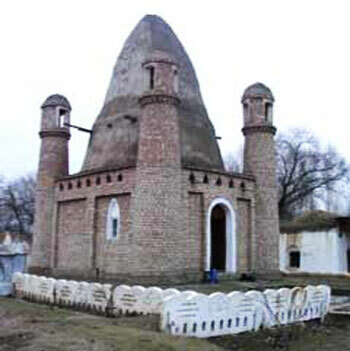 Located 15 km from Fergana and Kokand. As legend says the name of Marghilan is linked with the invasion of Alexander the Great to Central Asia in the 4th century BC Alexander the Great had passed the way from Khojand to Uzghen and back. During that campaign he visited twice the settlement that was long after named Marghilan. Local people met Alexander with bread and chicken. He liked the meal and asked about it. He received a reply: "Murginon" which meant "chicken and bread". From that memorable day the town was named as "Marghilan". More reliable records indicate that Margilan was an important stop on the Silk Road by the 9th century AD, along the route going across the Alay Mountains (ancient Mount Imeon) to Kashgar. Writing in the early 16th century, the founder of the Mughal dynasty, Babur, mentioned that “the pomegranates and apricots are superb .... the game in Margilan is good; white deer may be found nearby. The people are Sarts. They are a feisty people, ready with their fists. The custom of exorcism is widespread throughout Transoxiana, and most of the renowned exorcists of Samarkand and Bukhara are Margilanis. 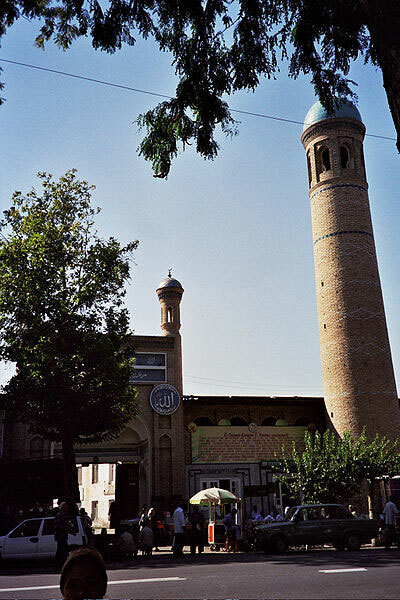 The author of the Hidaya (Burhan ud-din Ali ben Abu Bakr al-Marghilani) was from a Margilan village called Rishtan”. This reputation for toughness extends to modern times. Margilan merchants were key players in Central Asian commerce, and were said to be a law unto themselves during Soviet days, when Margilan was the heart of Uzbekistan’s black market. 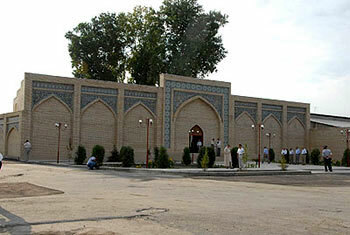 Margilan today is also a stronghold of conservative Islam. Since old days Marghilan has been famous for its wonderful and fine silk. Via the Great Silk Road traders brought Margilanian silk to Baghdad, Cairo and Athens. 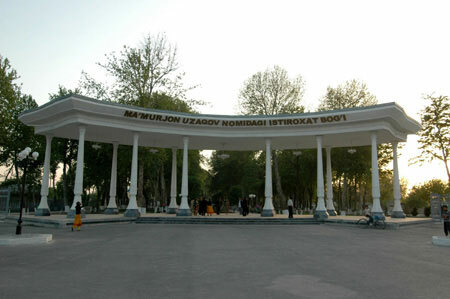 The town is also the location of Uzbekistan’s largest traditional silk factory, the Yodgorlik Silk Factory, is famous for its exquisite Margilan silk products. Employing over 2,000 workers, everything is done in the traditional manner, for an annual output of some 250,000 square meters of highly premium silk cloth. Neighboring Margilan Silk Factory employs 15,000 workers using modern machinery, and produces some 22 million square meters per year. Margilan silk stems from ancient times when Margilan entrepreneurs learned how to imitate chinese and european silk. Later, they developed a very original product now know as Margilan khan-atlas. The whole process, from obtaining silk threads out of cocoons to sewing the final product is done by hand, based on techniques used for centuries. It is uncertain when the secrets of silk production came to the Fergana Valley, but certainly, Margilan has been active in the industry since ancient times. 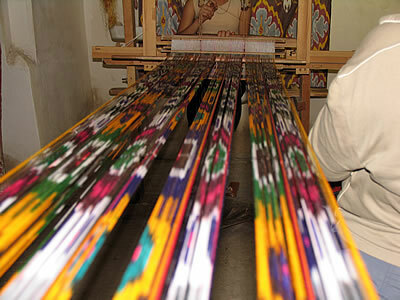 The factory produces silk both for domestic markets and for export.